Owner Brian Pelletier has been sustainably producing all-natural, hand-made chocolate confections since 2008. Now operating from two urban locations, this small business has earned a broad-based measure of sweet success, built on strong Green values. Would like to install solar power system on one or both stores. Planning to earn certification from St. Louis Green Dining Alliance. Continuing to increase recycling and composting. What we’ve tried to do from the beginning is to reduce our overall footprint as much as we can. Our product comes from thousands of miles away—that’s a given. So everything else we do is an effort to minimize our environmental impacts and maximize our benefits to the local economy. Connect with Green-thinking partners and customers to help promote your product and your sustainability values. Kakao contributes through sales and sampling events to the work of Missouri Botanical Garden’s EarthWays Center and Best of Missouri Market, and to events like St. Louis Earth Day and corporate Green fair. Kakao sponsored the 2012 Sustainable Backyard Tour, produced by another Green-thinking local business, Home Eco. Kakao has supported hundreds of local charities’ fund-raisers through product donations. Carefully evaluate building energy systems—and use a professional energy auditor and improvement consultant to make the most efficient upgrade choices. 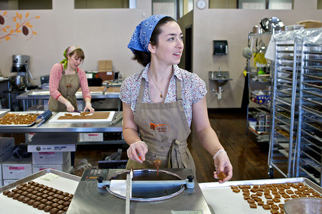 Kakao Chocolate is a member of the Maplewood Chamber of Commerce.